Here is part 2 video of some moments during the national family encounter made by Thea Annryle Payos, a Verbum Dei disciple in Cebu. Holy Eucharist presided by Rev. Fr. Iwao Ikegami, FMVD concelebrated with the Verbum Dei priests. Here is a video of some moments during the national family encounter made by Thea Annryle Payos, a Verbum Dei disciple in Cebu. 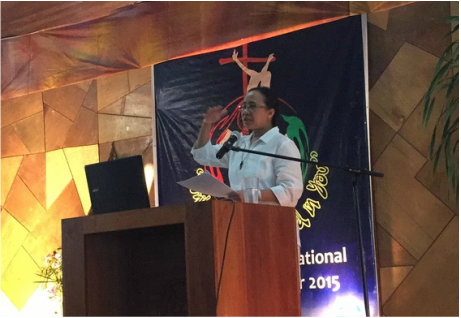 Sharing to you the 1st conference talk given by Sr. Luisa Mesina, FMVD during the national encounter. Watch the video presentation shown during the first day of the national encounter featuring the updates of the different communities here in the Philippines. A big thank you to everyone for making the whole event a fruitful one. Thanks to all the members of the whole Verbum Dei family here in the Philippines (Manila, Quezon City, Tagaytay, Cebu, Cagayan de Oro) and as well from our friends from China, Malaysia and Japan! I know all of you are excited for the photos. Please stay tuned as we gather all of them and post some of them here (some of the photos have been posted in Facebook as well). Videos from the conference talks will be posted here as well so stay updated. If you would like to post your own photos and videos of the event in Facebook, Twitter or Instagram, please don't forget to put the hashtag #vdnfe2015. 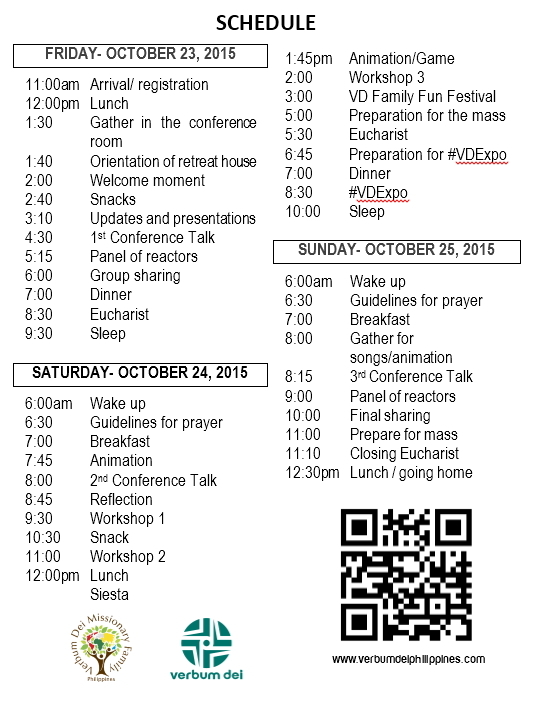 It's finally here, the 4th Verbum Dei National Family Encounter 2015! Follow this page for the latest updates on the event. ​For the participants, post your photos, videos, etc with the hashtag #vdfne2015 on Facebook, Twitter and Instagram. "Until Christ is Formed in You"